Stockholm-based Swedish tech company iZettle asked Fishburn Hedges and The Crowd & I to oversee the UK launch of its first mobile card-reading device, which transforms smartphones and tablets into card terminals, allowing small businesses in the UK to take card payments anywhere. Fishburn Hedges highlighted the business case for the product by revealing that every year tradespeople are owed £283m in late or unpaid bills. On the consumer side, it pitched the product launch to the nat­ional media as a wider business story, highlighting how iZettle can be used as an alternative to cash payments. The iZettle product had achieved a lot of attention and high sales in its native Nordic markets, and wanted to do the same in the UK. The team hosted a press briefing with a twist in London’s Southbank Centre last November, featuring a pop-up market that replicated the kind of business environment in which iZettle can be used. Small traders at the market accepted card payments through their smartphone or tablet and provided testimonials about the device to the media. MasterCard, iZettle’s investor, supported the event, along with its retail partner EE. The pop-up market attracted 70 journalists and stakeholders, ranging from the BBC to HM Treasury. Upon arrival, all the guests were provided with prepaid MasterCards to purchase small goods in the market such as coffee, candles and handmade hats. 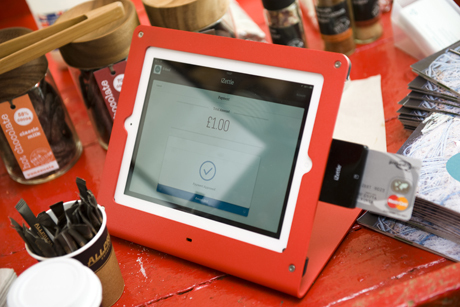 Only card payments through iZettle were accepted by the stallholders. Testimonials at the launch were provided by figures such as Amber Atherton from TV show Made in Chelsea, who uses iZettle for her jewellery business. Jacob de Geer, iZettle founder and CEO, announced a partnership with EE at the launch, while EE chief marketing officer Gerry McQuade and MasterCard’s UK and Ireland president Marion King made short speeches about the device. The launch event resulted in more than 80 media articles, including on BBC News Online and in publications such as the Financial Times, The Sun and ShortList, as well as in business, SME, regional, technology, mobile and payments trade titles. Sales of the device increased by 425 per cent, with 17,000 sold following the launch. The iZettle website experienced a surge in traffic in the week of launch, and it was named by Apple as one of its App Store Best of 2012 mobile apps, alongside brands such as the BBC iPlayer and Starbucks. Most of us have at some point tried to purchase an artisan cheese or fine wine from our local farmers’ market only to open our wallets and discover nothing but a black Amex card and overdue expense receipts. Cash – who uses it these days? Small businesses, that’s who. Thankfully, a raft of innovative payments firms are seeking to address this issue and we have seen considerable interest in this space as a consultancy during the past six months. The iZettle campaign made the best use of a limited budget to highlight the pain points felt by its target audience – tradespeople – and then bring the story to life in a way that showcased the product to consumers, who need to have trust in the device if it is to be adopted widely. The input of MasterCard and retail partner EE certainly helped in this respect, while the inclusion of Amber Atherton was a nice angle for the broader consumer press, helping to bring the market to life. Overall, the results represented a fair return on investment.